The AMS System is a fully integrated production management system which enables the workflow to be managed more efficiently. In tune with the concepts of cost saving and efficiency, this system increases the productivity and reduces wastages in more than a few ways. 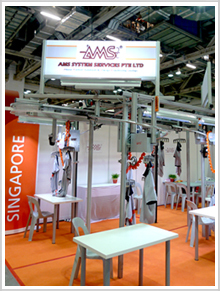 The AMS Systems has an inbuilt LEAN framework which focuses on value creation. The System streamlines the heavy management and operational processes in production. The System integrates the software, hardware and people which are integral components for an efficient manufacturing facility. Matters on production will then also be made visual and better communicated for better organization through the system. AMS firmly believes in training people at the different levels of operations and will be involved to support training for the management, supervisors and operators to ensure that the maximum productivity of the system.